Do you use Home Automation? Do you use Vera Products to trigger z-wave Device events in your home? Then try playing with this plugin. 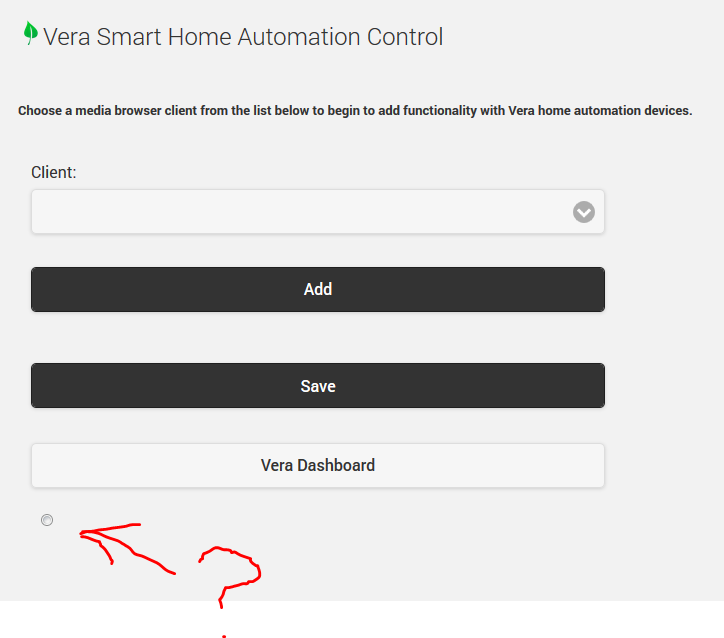 See to it that you have the Emby Device you want to use to trigger the events in your Home Automation on, and some scenes created in your Vera Device. CLick on your newly saved Device item, and start to add Vera Scenes to Media Browser Events. Sweet, I tried to make it simple! Yep, you bloody right it might be buggy! But, I've been having so much fun with this plugin I had to share it. Tell me if you like it, or of you think it needs to be fixed. Well besides the obvious fixes which I am aware of. Edited by chef, 08 April 2015 - 09:14 PM. Congrats getting your plugin to a usable state! Although I am having issues. First of all, not sure what this is?? Also, it seems I have to click "Back" twice at the Vera Dashboard page in order to get back to the main plugin menu. Edited by Xzener, 28 March 2015 - 01:48 PM. Yeah, the radio button is going to be for ignoring music playback events. So the saved playback scenes are not showing in the ui? Did you select and set up the entire room before you clicked save? I forgot to mention that you want to do that. In other words, choose all the scenes you want for all the events listed, and then press save. You can delete the device entry from the main config page and start it again. I hope that is what you mean. Edited by chef, 28 March 2015 - 02:12 PM. I did not click an unused selection... I simply clicked "Black Lights Off" for the play option and clicked save. Lemme attempt it again. May I recommend a "do nonothing" added to the drop down, otherwise others will have my same issue. Edit: Just tried again... Its not saving my scenes to be used for playback triggers. Edited by Xzener, 28 March 2015 - 02:21 PM. Okay, not saving them in the ui, when you return to the page? Or not saving to the "configuration" folder xml file properly. I can not recreate this. I'm only using the playback paused and unpaused part but I can confirm it doesn't save the unpaused trigger but the paused trigger does save. "Edit" It does not save to the xml file nor show up in the ui. Edited by wraslor, 28 March 2015 - 02:59 PM. I cant explain it... But its working now. All I do know is Firefox in my theater room wasn't allowing the save. I logged in directly to my server, IE allowed it to save. That is all that was different. MBC, not working. I set the plugin to send the "Black Lights Off" command when playback starts, and "On" when it stops. Neither command is sent. MBT working, although my video backdrops plugin is screwing things up. When I click "Play" while a video backdrop is already playing, the black lights come on while the movie starts. I guess the plugin senses the video backdrop playback stopping, sending the "Black Lights On" command. I know this may be difficult... But is there any way to ignore the video backdrop plugin?? By the way... BRILLIANT WORK CHEF!!!! Loving it!! Chef, check your in box. Here, I know why your not saving properly. Once you have selected a Device on the main page, and it has been added to the main pages list of devices. Once the list of Devices has been saved on the main page, now you can click on them to enable Scene editing properly. If you don't save the main pages list before you enter the Scene editing, the scene information will not save either. Playaback pause and Unpause might not work properly. PlaybackStart and Stop will work best at the moment. I know about this. Thank you wraslor! Edited by chef, 28 March 2015 - 03:07 PM. I have read articles which describe things like this happening. In the meantime, perhaps it would be best to use Chrome browser which seems to be working best. And yes we can ignore Intro plugin videos... I think. Edited by chef, 28 March 2015 - 03:12 PM. Does it read start and stop with play and pause? What i mean is with my setup I have it set to lights off on mb start and on when you exit mb. I want it to bring the lights up half when I pause and back off when I resume. Edited by wraslor, 28 March 2015 - 03:12 PM. Chef, check your inbox... again. Yeas You'll have to create a scene for your lights to be dimmed half way, but Once I wire up the Pause and Unpause events, that won't be a problem. Here we go! No more save button on the Main Page. the profile you choose will automatically save. at least in Chrome it will. @wraslor !! this one handles Playback Paused and Unpaused events! There is a small delay because there isn't actually any formal events for Playback Paused and Unpaused. So, i check the Playback Progress to see if the server is reporting a stand still in media. If it is we trigger our own event, and the same for when the media has Unpaused. This is why it wasn't wired up at first, we had to make sure we weren't polling for the wrong Progress and stuff. I'll add the awesome plugin icons that xzener made next! Edited by chef, 29 March 2015 - 12:11 PM. Edited by AgileHumor, 17 April 2015 - 01:32 AM. Is there anything in this plugin that allows the Vera to control MB? I guess it would be mostly preconfigured "remote commands or Macros" that can be triggered from any HA system that can use an HTTP request to control Emby Server. That would really require a plugin written for the Vera. It's a completely separate thing. Sweet! Techy warrior. Even if the plugin is a little bit buggy right now, it could not have been even remotely possible with out your patients. Edited by chef, 29 March 2015 - 01:57 PM.